Every day we receive phones calls from couples looking to hire a disc jockey for their wedding. Many of these people are shocked to find out that we have no Saturdays available for up to a year and the popular dates are taken up to two years in advance. We are asked all the time; how far in advance should I book your services? The answer is simple “as soon as possible” and in this article; I will attempt to explain why. Although Fridays and Sundays are becoming quite popular for weddings, the most popular day of the week is still Saturday. The most popular months of the year for weddings are April through October. By doing the math, you can see that there are approximately 30 prime Saturdays per year. Many wedding vendors, such as disc jockeys and photographers are only able to offer their services to one customer per day. So, it is easy to see how many of the top vendors are booked up a year and a half in advance. 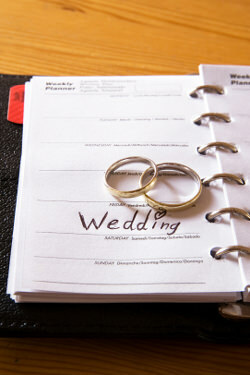 During the planning process, one of the first things you will need to do is decide on a wedding date. Next, I suggest you begin to secure your main vendors as soon as you have decided on the date. You also need to prioritize your vendor shopping. This means you should start with the vendors that typically offer their services to only one customer per day. Some of those vendors are Wedding Photographers, Disc Jockeys, Live Bands & Musicians, Videographers, Wedding Coordinators and some Banquet Halls. When you hire most of these vendors, you are normally hiring them based on the talent, or service of an individual person. Take Disc Jockeys for example, although there are booking agencies and multi-system companies out there, most brides & grooms hire their DJ based on the talent of a particular person. The same holds true for Photographers. Many companies offer several Photographers, but not every Photographer has the same style and skill level. These are the vendors that you need to book as early as possible, because once someone else books them, it’s too late! Does that mean that you can’t plan a wedding in less than a year? Absolutely not, but if you want “your choice” of the best wedding professionals in your area, then you need to begin planning early.